For day two, I wanted to use as many of the different vegetables in my shiny new farm share box as I could. 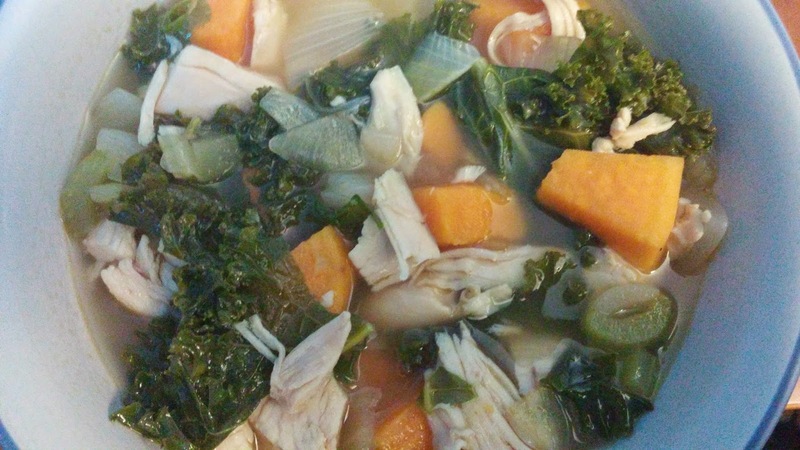 After googling combinations, I went with this Chicken, Sweet Potato & Kale soup from skinnytaste.com. Here is a picture of my final result. It calls for celery, sweet potatoes, onions and kale; allowing me to use four of the veggies in my box in one meal. It was a big success. I would absolutely do this one again. I did make some changes in order to make it easier to do on a work night. The recipe calls for raw chicken to be cooked in the broth for 20 minutes. I grabbed an already cooked rotisseries chicken from the grocery store and rough chopped the breast meat and just skipped that part entirely. I also used the spices I had on hand which did not include a jalapeno or cilantro. I sauteed the chopped onions in oil in my Dutch oven before adding the celery. After about 5 minutes, I add minced garlic along with salt, pepper and Italian spice mix and some ground chili powder I had. In about another 3 minutes, I added in the chicken broth and the shredded breast meat from the rotisserie chicken along with the kale and sweet potatoes. I put the cover on and left it on medium low heat (about 4 on my dial) for 30 minutes; stirring half way through. It was delicious. I will definitely be going back to skinnytaste.com to check out some other recipes. We both ate and we still had about two bowls worth for left overs for later. For dessert, I chopped up those 6 strawberries we got and served it with a couple of spoons of whipped topping. Result: I used onions, kale, sweet potatoes, celery and the strawberries. All I bought was the rotisserie chicken and my husband is already planning on eating the drumsticks for lunch tomorrow. This one was a definite success. The soup was fairly filling and had a sweet and savory taste to it. Tomorrow night my in-laws are taking us out to dinner for my husband's birthday so no experimenting tomorrow. I have already started looking for Saturday's meal though.